Thanks for the link, Julie! Interesting to see that you can fall in love with the book even if you don’t get all the text! van Genechten’s illustrations are so fun and, well, friendly, that I’m just not surprised! I’m planning a post on some wordless picture books by him, so I’ll keep you posted. I look forward to it, Kai. Bilingual books are wonderful. They are used in many schools for dual language programs. When I sold books, companies seemed to be expanding the nonfiction selection, but there weren’t a lot of picture books. This looks like a good one. Have you done a post of bookselling tales? Me interesaría! Julie, these are great finds! My boys are taking Spanish in school, so I’m always interested in bilingual books. BTW, Just found a book I thought your boys would like, though not bilingual: Super Submarines, by Tony Mitton and Ant Parker. Two good bi-lingual books. I like the Dutch one in particular, since I have never seen one in print. It’s so important for children to learn a new language in early elementary school. Statistics show the earlier you learn another language, the easier it is to learn others later on in life. I learned French in my public school’s kindergarten class. To this day, I love French, although I don’t have the opportunity to use it. My teens are using Rosetta Stone French in our home education. I hope they will have the chance to use it someday! I’d be interested to know how you like the Rosetta program. My father kept some french picture books that I poured over when I was very young – which was probably why I chose to take French in HS, but never really learned to speak it well. I learned German as an exchange student, and lucky for me I have a great group of German friends that I meet up with at least once a month, since my German husband couldn’t be bothered! I’d suggest a good teacher. Though my kids never took HS Spanish, they certainly heard about the teachers! I like that is has direct translation into Spanish versus the “spanglish” approach some books take. I agree, Lauri, that it is better not to imply direct translation, but I also think it’s good to sprinlke words, to awaken interest where there might not have been. I want those red BOOTS! 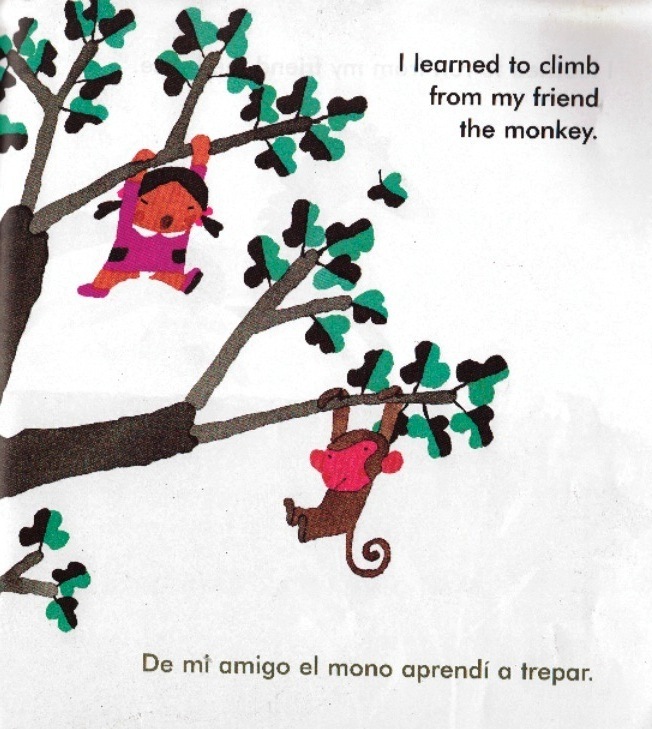 I have looked at a lot of bilingual books, and agree that the quality is not always what I would hope. it’s great to see My Friend/Mis Amigos seems a good Sp/Eng choice. I love that he loves his boots – I love my knee high rubber ones too! I like good bilingual books. So simple. The first one looks like something you’d illustrate. Good books for the classroom. Also like your new header. I can only hope to ever come close to the perfect simplicity of his artwork! I don’t have any crocus showing blooms yet – but I thought it was okay to ‘force’ a few bulbs! The boots are a hit! Maybe I’ll include my own boots in my next header. I also love the boots! It sounds like those are a couple of good books. 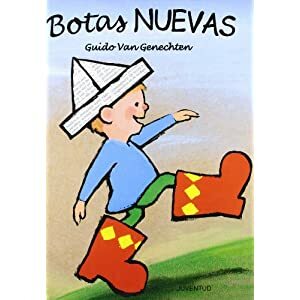 I still need to find a translator for the boot story! I want someone to read it to me! I like bilingual books!! I read with a lot of Spanish speakers and they try to teach me Spanish. I know “Un perra bonita!” and “sientate!” And i like those red boots too! That book looks really cute! I’ll have to look for both of these! Thanks! Does that mean you are a girl, Rhythm? I got to use some sheep in a congratulatory msg to a friend whose ewe just had twins today! They enjoyed having a purpose! Have you read I Love Saturdays y domingos by Alma Flor Ada? The Cuban-born author writes books featuring the Latino culture. 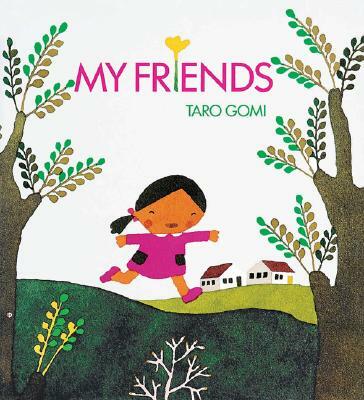 This picture book tells of a young girl who enjoys the similarities and differences between her English-speaking and Spanish-speaking grandparents. Although I Love Saturdays y domingos is written mostly in English, the conversations between the main character and her Spanish-speaking grandparents are in Spanish. May have forced my bulbs too early – it’s snowing again!